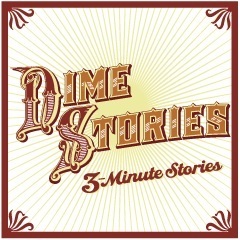 DimeStories are three-minute stories read by the author. Initially hosted by Amy Wallen, founder and host of DimeStories Live reading series since 2004 and now DimeStories radio series, these tiny stories are often funny, poignant and always thought-provoking. Host, Amy Wallen is a best-selling novelist, Los Angeles Times frequent contributing book critic and comedienne. DimeStories was brought to the attention of public radio by producers Jay Allison, James Spring and Viki Merrick. A young girl never sees the child she's babysitting. A woman is surviving a loss and encounters a stranger who senses her need.